Your staircase railings may perform an important safety function, but they should also play an important role in your home’s aesthetic. When carefully chosen with your house’s design in mind, staircase railings can truly complement the sense of style and elegance of your home. Design tastes of all type — from traditional to contemporary or even ultramodern can be expressed in your handrail choice. By working with a professional designer, we welcome you to play with ideas, combine materials, and elevate your railings from safety tool to artist statement. There’s something dramatic about a staircase. As it moves to different levels of the house, it automatically draws the eye. 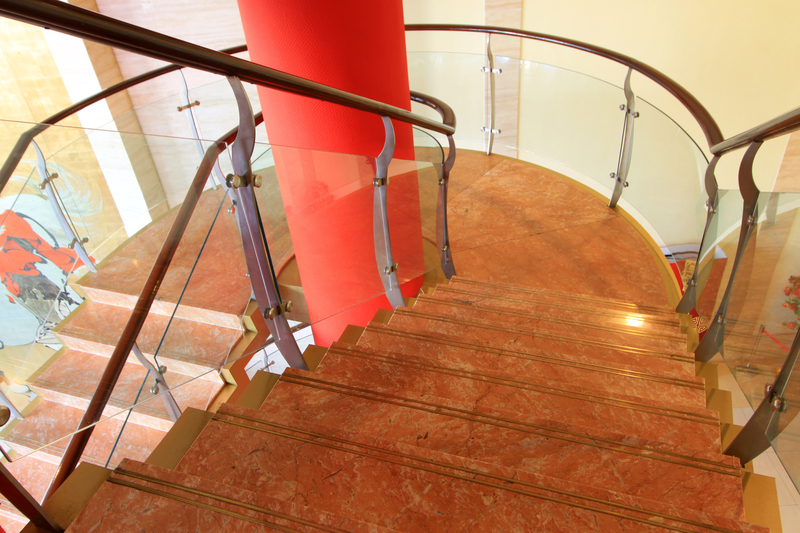 Glass railings bring sleek elegance to your staircases. They allow for the easy movement of light between levels of your home, contributing to an airy, bright feel. Glass railings, like all glass architectural elements are fully customizable. We recommend keeping the material at least partially translucent to allow for the easy movement of light, but the glass can be clouded for extra privacy and tinted or infused with any colour you imagine. From frameless shower doors to open concept homes, minimalism is currently a leading design trend. Clear glass railings embrace minimalist chic completely. Transparent panels are used to allow the optimal movement of light, allowing smaller spaces to feel bigger and brighter. Along with being minimalist aesthetically, these practical railings also require minimal maintenance. Just a wipe with your favourite glass cleaner is all you need to keep them looking perfect. While we love the look of pure glass, glass guard panels can be combined with wood or metal railings in limitless styles. Contrast glass with the softness of wood for modern elegance or combine glass with the metal hardware for a more industrial look. A popular choice is to combine all three materials for a look that marries classic to contemporary. Whether you’re looking for handrails made entirely of glass or glass panels to complete a railing made of multiple materials, you’ve come to the right place. The expert designers at House of Mirrors and Glass are able to create custom pieces of glass that meet the unique specifications of any project. Come by House of Mirrors and Glass today to meet our team.